Many people know of desegregation as it happened in the American South, but this exhibition shares the story of the landmark struggles of Latino families in Southern California almost ten years before Brown v. Board of Education. Para Todos Los Ninos - Fighting Segregation in California, which will premier at the MOT, shows the history of segregation and discrimination in California that targeted all non-White citizens, in housing, jobs, and schools. Participants learn the dramatic story of Mendez v. Westminster and the broad multi-racial grassroots efforts, including lawyers and activists, to end school segregation in rural Orange County. Participants will learn of their impact in closing not only “Mexican schools” but in battling segregated schools for all. 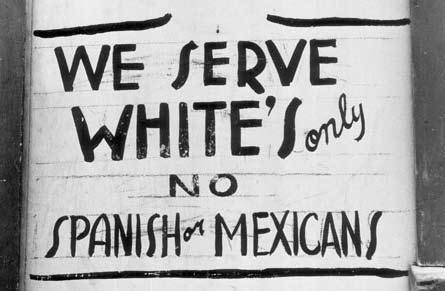 Prior to the 1940s, signs such as this were common throughout the Southwest.